Hawthorn’s November Photo Scavenger Hunt. Hi there Scavenger Hunters and those of you just dropping in for a nosy. 😄 It’s Kate/ Hawthorn’s last Scavenger Hunt of 2018, so I thought I’d better make an effort and join in. Though I did find some of the prompts pretty tough this time around. Still I do like a challenge, so here goes…. Post/Mailbox. I’m still loving Postcrossing, which is a fun way of sending and receiving postcards from all around the world. These three are off to Italy, USA and Japan. I have already popped them in the post box. Decay. Bracket Fungi , according to Wikipedia are an ‘ important agent of wood decay, playing a significant role in nutrient cycling and carbon dioxide production of forest ecosystems’. Go bracket fungi! This one was snapped a couple of weeks ago in Ravenglass. Strand. Here are my two god-daughters on the shores strand-line in Ravenglass. Hugo is also there, splashing in the water. We loved our time away in this coastal Cumbrian village. You can read about our weekend Here. Fold. Sorry, its those ‘Festival Sheep’ again. I ended up using the word ‘fold’ in the context of ‘a flock of sheep’ and these are a colourful meadow full near Ravenglass. The farmer marks the ewes that have been impregnated by a ram. I think the different colours mean different fathers and also the number of lambs expected per mother. My Own Choice. Definitely making my own mouth water here. Wil took me out for tea on my Birthday to Bowland Beer Hall. This was dessert. Yummy! Who else loves Churros with chocolate sauce?? Hawthorn’s Photo Scavenger Hunt ~ April. Hello there, I am joining in with Hawthorn’s Photo Scavenger Hunt once again. This month I have had to rummage round in the archives for my pictures. Feeling like a Time Traveller! Swirl. I spent a little while looking for swirls and whirls and ended up settleing for this bright display of swirly plates I saw in Essaoirra in Morocco some years ago. Also tagines make purrfect cat beds. Obviously. Wood. I don’t go to many art exhibitions but a hanging display in the woodland of Grizedale Forest back in 2009 was a really effective gallery, I thought. Balance. 2009 was also the year we went to the South of France…and found ourselves in Cannes, when its famed film festival was showing. Pictured is a rather dapper mime, balancing two white ( and very real) cats in his arms. Very bizarre. Letter. In those days Brangelina was still a thing and this banner is a love letter to Brad Pitt and his then wife Angelina Jolie. The crowds were waiting for the star couple to tread the red carpet. Brad’s film ‘Inglorious’ was showing at the festival. We waited too…but alas not long enough! Our friends who we were holidaying with ,had an understandably cranky 18 month old with them. Brangelina were fashionably late of course and babies and international film events don’t really mix. C’est la vie. My own choice. To show we were really there, early morning at the 62nd Festival De Cannes. See what the other scavenger hunters have found over on kates blog. Hawthorn’s Photo Scavenger Hunt ~ February. Hawthorn’s Hunt totally crept up on me this month but I managed to scrabble a few pics together. They are all actually taken this very morning! So sorry that they are not exactly the most interesting. And mostly dog themed! White. Yes more snowdrops in my blog posts. This is the fourth post I’ve done where snowdrops have appeared. But they are so pretty and of course , white, so I couldn’t resist. 😄 These were taken on my walk with H this morning. We sneeked over the cattle grid onto the drive of a private residence called Standen Hall and I quickly took this photo. Metal/metalic. We came accross this rather scary metal dog face nailed onto a fence near Standen Hall. Never seen it before so I can only assume its a recent addition. Then I thought, maybe its actually a poo bag dispencer for dog walkers? Will look out for bags in the future. Begins with a J. Spotted this bright red double-decker bus next to nearby Holmes Mill. It made me think of bus journeys and how I used to feel travel sick on buses, but never on double deckers strangely. Bud. Daffodils coming into bud near Standen Hall. My Own Choice. A combination of photos from my morning so far…and its not even 10am. I had better get the washing on! So my Photo Scavenger hunt for October is not going to be very inspired, as I haven’t been out and about very much. It’s been a quick scramble to find some suitable pictures. Here goes ! 1. Making. I have been Making progress with my Christmas shopping! I know, a bit to organized. But when having a mooch in Oxfam the other day , I saw some really cute recycled paper bird houses and couldn’t resist buying them. Oxfam have a really fun gift selection this year, including some lovely books and… Beer Bread. Nice stocking fillers. I also found a couple of bits in ‘ The Keep’ , a really fab gift shop in Clitheroe. I’m on a roll ! 2. Empty. 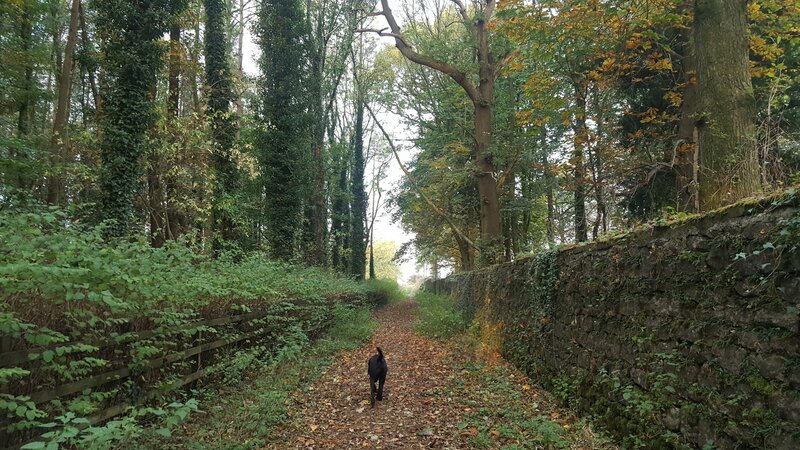 It’s always good to walk Hugo in the early morning, when the woods and fields are Empty, save for us and nature. 4. Paper. I have recently picked up this spooky looking paperback. 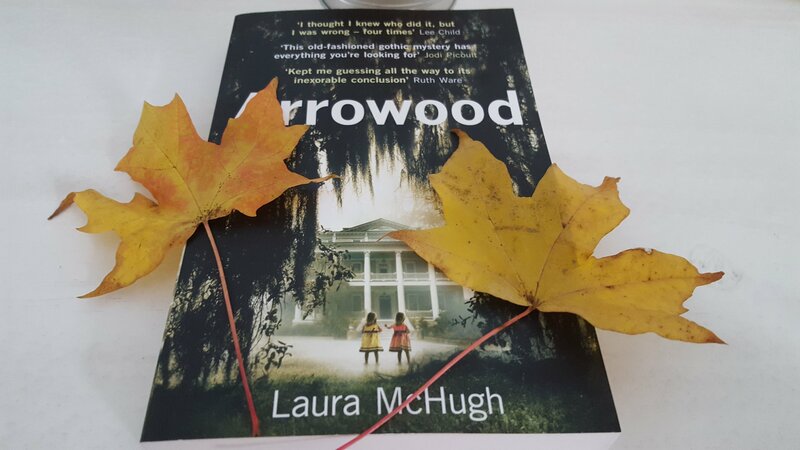 Thought it may be a good Halloween read. Anyone read it yet? 5. Neat. 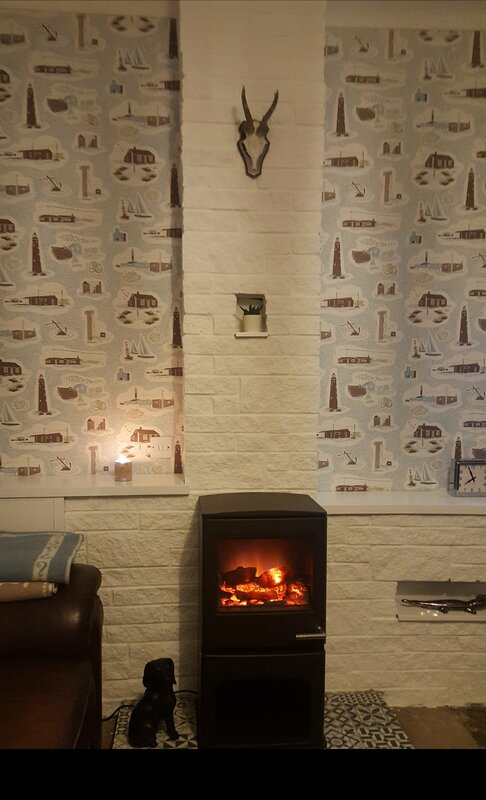 Hurrah that my other half is so neat at wallpapering and tiling! Living room coming on now. Will post some more pics when completed! 6. Street. 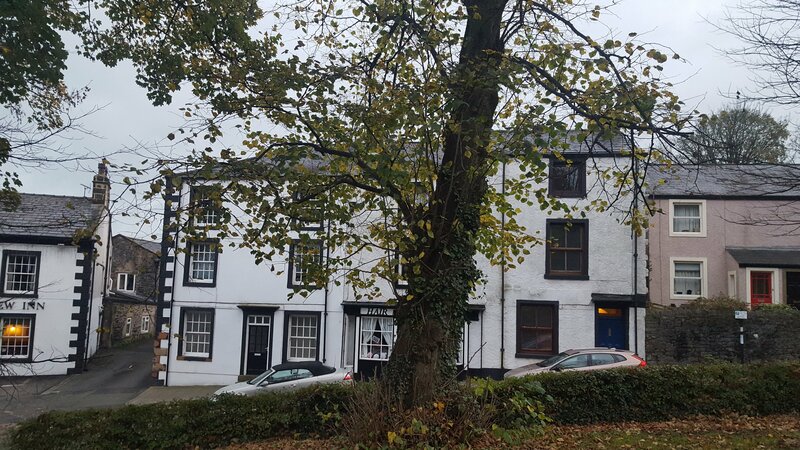 A photo of a Clitheroe Street taken from inside the Castle grounds, on a walk with Hugo. 7. Kettle. So here’s a very boring picture of my kettle. It lives on top of the microwave , as space is at a premium in our kitchen. 8. Unexpected. It was Unexpected to see a singer sewing machine on a wall in Boot ! This photo was actually taken last month, on our holiday in The Western Lakes. 9. Vase. I love my seahorse Vase in my bedroom window, but I’m not sure a bunch of flowers would suit it. What do you think ? 10. My Own Choice. 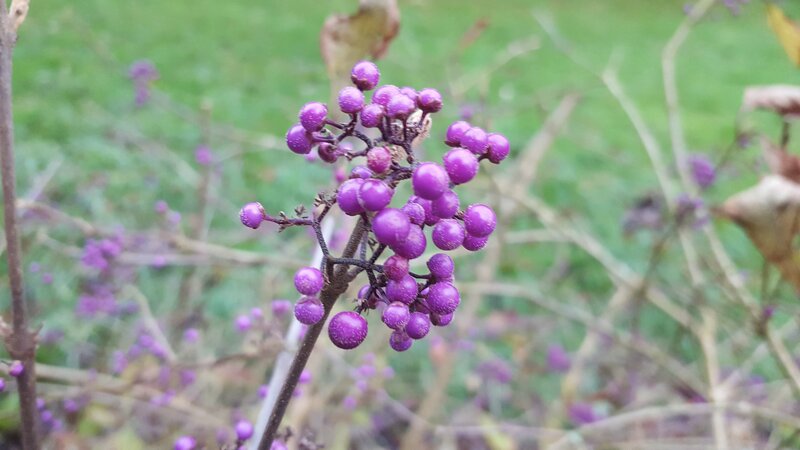 This shrub in the Castle park bares purple berries every Autumn. I always wonder what it is? Any ideas? Thanks to Kate / Hawthorn for arranging the Scavenger Hunt once again.